In the agenda view the search only includes events during a period of 60 days (if not changed). I think this comes with difficulties as I will have to know when this event might be, and in case of a passed event this could lead to difficulties. 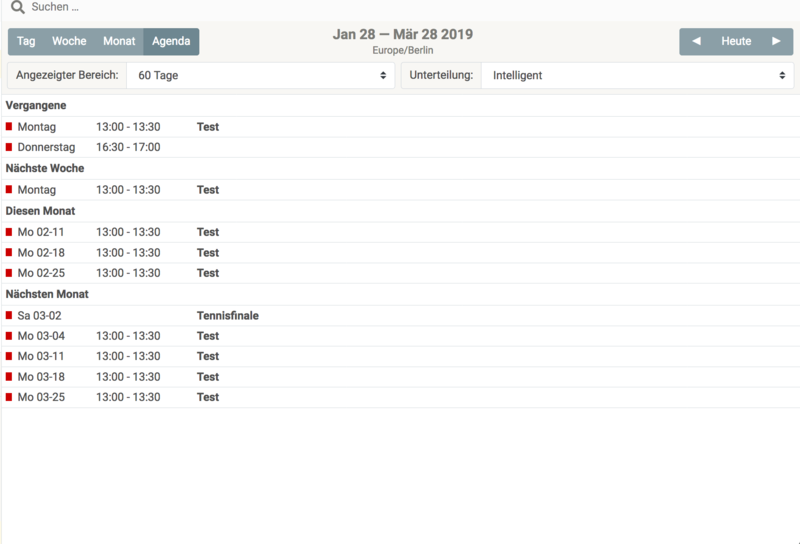 Search an event while in the agenda view. You only see events the next 60 days. You see all events that fit to the search. isabel.pacheco renamed this task from Search option in agenda in limited to futre 60 days by default to Search option in agenda in limited to future 60 days by default. isabel.pacheco moved this task from In Progress to Done on the UX Seminar WS17 board. Could we "fake" search all by searching untill we find ~30 results and then search some more when the user request more results? I think current behaviour is there to get best performance for most common case. It could be "faked" this way, I guess, but not that easy.